Ready to take your playing to the next level? The right drum triggers can help you get there. While they’re just one part of the setup, they can make all the difference in providing crisp, clear sounds without any lag – and they can bring whole new layers of dimensionality to your group’s music. Just like other electronic components, drum triggers are available at different prices, with a variety of pros and cons to keep in mind while deciding which are best suited to your needs. Even though drum triggers are designed to provide a similar function, not all brands and models deliver the same performance. Let’s take a quick look. System compatibility –Double-check to ensure that the drum triggers you choose are compatible with your acoustic drum trigger module. Most brands are interchangeable, but there may be exceptions. Drum type – Some triggers are designed to fit toms, some fit basses, and some fit snares. Some triggers are versatile enough to fit just about any drum. Once fully assembled, a well-equipped kit tends to include different types, which extends the player’s range and allows for far more sound options than a minimalistic kit with just one or two triggers. Drum trigger type–Depending on your setup and playing style, you might prefer different types of drum triggers. Some pick up vibration from the drum’s head, while others are designed to sense the vibrations emitted by the drum’s shell or rim. Single or dual – Most drum triggers are designed to pick up vibrations from a single source. There are a few dual triggers available, however; these mount to a single point on the drum and allow the drummer to strike different points (i.e. head or rim) and get two different sounds from the same trigger. Mounting style – Head contact drum triggers are stuck directly to the drumhead with adhesive, while rim mount triggers are contained within protective housings. With these considerations and a few other points in mind, we’ve curated this review, which includes five of the best drum triggers currently available. 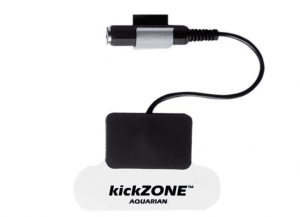 The Aquarian Kickzone Bass Drum Trigger features an adhesive backing and a cord / cable control bracket for secure, reliable performance. Easy to use with any bass drum, it works with a mono jack and is compatible with Aquarian systems as well as other drum modules. Who will enjoy playing with this drum trigger? If you’re looking for an inexpensive bass drum trigger that takes you from the stage to the recording studio without common faults, you’re likely to appreciate this one from Aquarian. It’s easily one of the best bass drum triggers available in this price range. The Pintech Percussion RS-5 acoustic head trigger features a “Kwik Klip” mounting system for quick, easy setup and teardown without damage from adhesives. This head trigger can be mounted to the drum’s head or shell as desired. The trigger cover is small yet sturdy, protecting the sensitive inner electronic components from damage. If you’re looking for a versatile acoustic drum trigger, that works with a variety of setups, then you’re likely to appreciate this one. It is easy to position anywhere, and it will pick up all vibrations with ease. It’s not as cheap as some other models, however, it is built to last. The Roland RT-30H Drum Triggerinstalls on almost any metal drum hoop. It features a self-guided mount for quick, simple installation and optimal sensor positioning, along with a fiberglass-reinforced ABS body for reliable durability. This drum trigger is compatible with Roland TM-2 trigger modules as well as TD-series V-drums sound modules. It also works with SPD-series percussion pads. If you’ve made it beyond the beginner phase and you’re ready to expand your drumming horizons, then you’re likely to appreciate this the Roland RT-30H drum trigger. It’s versatile enough to pair with almost any drum, with no need for manual adjustments once in place. The Roland RT-30K Kick Trigger is designed to allow drummers to play electronic sources from any acoustic bass drum. With a fiberglass-reinforced body to provide protection for the components housed inside, it features a secure mounting mechanism with self-guiding capability for quick, easy installation. A TRS connection cable is included. This kick drum trigger is compatible with Roland TM-2 Trigger Modules, SPD-series percussion pads,and TD-Series V-Drums sound modules. 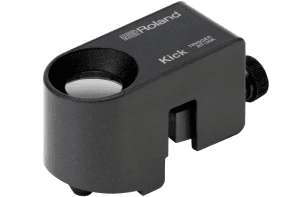 If you’re tired of double triggering and other common problems with bass drum triggers, or if you’re ready for an upgrade, you’re likely to appreciate the accuracy and crisp sounds this Roland trigger provides. While it does represent a small investment, it provides an instant upgrade for your kit. 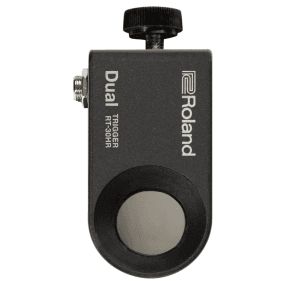 The Roland RT-30HR dual trigger lets you play multiple electronic sources with the same device. With a built-in sensor for the head as well as a built-in sensor for the rim, it eliminates the need for two separate sensors. This dual drum trigger features a durable fiberglass-reinforced housing. It is compatible with almost any metal drum hoop, and features a self-guided mount for foolproof installation. A TRS connection cable is included. The Roland RT-30HR is compatible with Roland TM-2 Trigger Modules, SPD-series percussion pads, and TD-Series V-Drums sound modules. If you’d like to get two different sounds from the same drum, consider adding a Roland RT-30HR dual drum trigger to your kit. While it’s a little more expensive than a single trigger, it gives you plenty of versatility. While this trigger can be mounted on almost any drum, Roland recommends mounting it to the snare for easy access and rapid-fire triggering. The good news is this: Even through drum triggers are technical marvels that go a long way toward enhancing your performance, it’s easy to choose good ones. Here are a few things to keep in mind. Durability: As with so many things, durability tends to come with a higher price tag attached. While fragile head contact triggers do cost less, they’re prone to damage due to exposed wires and jacks that can be pinched and hit. These drum triggers work well but they do need to be replaced more often. Over time, the expense can add up. Price: For the most part, your drum triggers are going to be among the least expensive components in your kit, assuming that you’ve chosen quality components. Even the best drum triggers seem ultra-cheap in comparison with larger items! For this reason, it’s a good idea to ensure that other factors play starring roles in the decision making process. 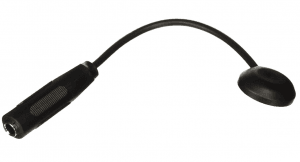 Cables: Some drum triggers use standard guitar cables (¼” to ¼”) while others require XLR to ¼” cables. Know in advance that these cables (either type) can go bad and be sure to keep an extra on hand, particularly if you’re using a brand that requires XLR to ¼” cables. Drum rim height: If you’re considering rim mount drum triggers, check to ensure that they’ll provide good contact without muffling your drum. Many of the newest options are adjustable, so you can find the perfect setting without difficulty. Unless you’re on an ultra-tight budget, it’s a good idea to get the best drum triggers you can. Even if it seems like overkill now, you can grow into them and you won’t be faced with the inconvenience of replacement at a later date.